It was August 15, 2016, I was having lunch with someone. Gazing at the news on the television screen behind me, she asked, "It's India's Independence Day today! Independence from whom?" Independence from the British, I answered, shocked. Shocked, because this someone in question was British and she had not a clue about the crimes of her country's colonial past. 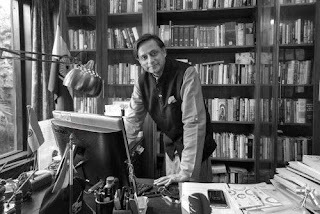 Like millions of Indians and non-Indians, I was left aghast and despondent when I heard the viral Shashi Tharoor Oxford Union debate (if you haven't seen it yet, you've been living under a HUGE rock, and I suggest you watch it before you proceed to read the remainder of this blog). Tharoor in all his articulate and intellectual glory spoke in motion for Britain owing reparations to her former colonies. 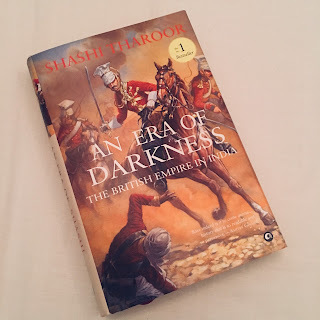 Tharoor's well-researched facts on the brutality of British rule in India for over two centuries left me astounded, and a sense of shame dawned on me - I knew so little about my country's past. 'India's struggle for Independence' was to me merely Chapter 13 of my school history textbook, one that me and so many of my peers drearily crammed a night before exams. Following his debate, Tharoor was himself shocked at the viral reactions received - he thought he had not said anything new and was simply stating widely known facts. His publisher then proposed he convert his speech into a book to illustrate the horrors of colonial exploits to the Indians and Britons of today. Thus, I found it moral and imperative to read 'An Era of Darkness' to educate myself, for in Tharoor's own words 'If we do not know where we come from how will we appreciate where we are going'. Britain destroyed India's famed textile, shipbuilding and steel industries, reducing India's GDP to 3% by the time they departed India (a sharp contrast to the early 1800s when India's share of the world economy was a whopping 23%). Courtesy the heavy taxation levied upon Indians during the Raj, India was Britain's biggest source of revenue at the end of the 19th century. Over 74,000 Indian soldiers died fighting Britain's cause in World War 1; London's Imperial War Museum pays tribute to animals that went to war, but sacrifices by millions of Indians remain untold stories. The British were not interested in educating Indians and left India with a sordid 16% literacy rate. They taught English to a handful of Indians only for the sake of interpretation. The railways built by Britain in India was not for the benefit of Indians but to further their colonial cause and profit from trade. One Briton discovered tea leaves in Assam, and thus spurred India's tea cultivation spree by the British, for the British. British greed for commercial gains resulted in vast forest lands to be razed down, to grow tea, coffee and timber. When General Dyer, the man behind the Jallianwala Bagh Massacre, ordered his soldiers to fire every bullet unannounced in the hearts of 15,000 people gathered unarmed to celebrate Baisakhi, the British rewarded him a handsome financial sum and presented him a bejeweled sword! Colonialists like Thomas Pitt looted India; he took off to Britain after resigning from the post of Governor of Madras after acquiring a 400 carat gem. The 'Pitt Diamond' represented the widespread extraction of wealth by the British from India. The British 'Divide and Rule' policy resulted in the Hindu-Muslim strife that eventually culminated into the Partition of India in 1947, creating a new Pakistan that Indians of Muslim faith could call home. British barrister Cyril Radcliffe was tasked to partition India and Pakistan within 40 days; the lines he drew across the map dissected families, homes, fields and villages. It took me a month to complete the book because I had to pace myself - I could never read more than 6-7 pages per sitting as the content was heavy, moving me to the point of feeling bereaved for all that India lost. Tharoor's style of presenting facts keeps you gripped and whilst handling issue after issue, he slips in his characteristic wit and irony. The book prompted me to learn more about Partition. This BBC documentary 'India Partitioned' and Eqbal Ahmed's 'Stories my Country Told Me' opened my eyes to the harsh realities of Partition, which hit close to home. Before Partition was officially announced by the British, my grandmother was a teenage girl when her family decided to leave their home and belongings overnight from Sindh (province in Pakistan) and emigrate to 'the Indian side', in Rajasthan, with just a handful of jewelry, and wearing several layers of clothing. Had they left when Partition of India was declared, my grandmother would have been a part of the resulting largest mass migration in human history which displaced 14 million people, and left 1 million dead. I would not have been here to write this story. Early this month, at a dinner event, I was in conversation with a someone who mentioned they visited Pakistan, and in spirit of sharing some trivia, I mentioned I am Sindhi, and prior to Partition, my great grandparents called the Sindh province of Pakistan home. With a quizzical look, she asked me, "What do you mean by partition?" Once again, I was shocked; shocked because she too, was British, and she did not have the slightest inkling that Partition was the bloody legacy left upon independent India by the imperial British. There was another incident that left me speechless. A British restaurant thought it would be a good idea to introduce 'The Colonial Brunch' featuring dishes from Britain's former imperial era colonies. Colonial Brunch, SERIOUSLY?! What aspect of colonialism are you proposing to celebrate?! Celebrators of colonial era glamour, just pause to think; you are actually celebrating power that corrupts, and immoral conquests that destroy identity, crush pride and exploit resources. So fellow Indians, Britons, and the rest of my global millennial friends, let us educate ourselves of our past to counter - as Tharoor says - 'historical amnesia', for if history is any indication, we do not want to plunge into 'an era of darkness' once again. 'An Era of Darkness' is published under the title 'Inglorious Empire: What the British did to India' for the UK market. I find this title far more apt for that audience. Don't have the patience to read the book? Listen to Tharoor speak at the Antidote Festival, Sydney. Have less than an hour? Can you spare less than 10 minutes perhaps? Then watch this. Tharoor encapsulates the essence of his book in his response to questions from an Australian on the seemingly rich legacy the British left in India.